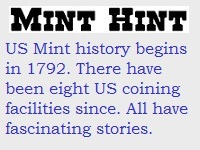 In total, eight US Mints have served the nation since the founding of the first Mint in Philadelphia in 1792. The Philadelphia Mint began striking regular issue coinage in 1793, and remained the only minting facility in the United States until 1838, when three branch mints were opened to meet the demands of a growing nation. Of those eight facilities, four of them remain in operation today. Those still pumping out coins are Philadelphia, Denver, San Francisco, and West Point. The mints in New Orleans, Dahlonega, Charlotte, and Carson City all ended their days of active production long ago and are now firmly entrenched in the annals of time. This section offers illustrated summaries of United States mint facilities. All have a fascinating story to tell. We call it the "Saga of the US Mint". Journey with us as we meet the first Director of the Mint, David Rittenhouse. Imagine yourself as a coin press operator in New Orleans in 1861, declaring your loyalty to the Confederate States of America. Hang on to that saddle as you gallop past the new mint building on Carson Street. Picture yourself in the immediate aftermath of the San Francisco earthquake of 1906, thankful the "Granite Lady" held steadfast as the only financial institution to survive the devastation, to become the focal point of your city's recovery. Are you ready to begin experiencing the "Saga of the US Mint"? To get started, all you have to do is pick from the list below which Mint you want to learn about first. "The First Inspection", depicts George and Martha Washington examining the 1792 half disme pattern, the first coin ever struck bearing the name of the United States (post-Constitution). As this (perhaps imaginary) scene unfolded, the original Philadelphia Mint was about to begin construction. Public domain image. The Denver Mint was established on paper in 1862, but did not begin striking coins until 1906, when the facility above was completed. Still housed in this building, the Denver Mint can produce over 50 million coins a day. Image courtesy of ANA. The San Francisco Mint was one of the few buildings to survive the devastating earthquake of 1906. The intact structure was used to stage numerous financial operations to help the city recover. Image courtesy of National Archives.